Happiest days...? Perhaps not, but formative days, certainly. 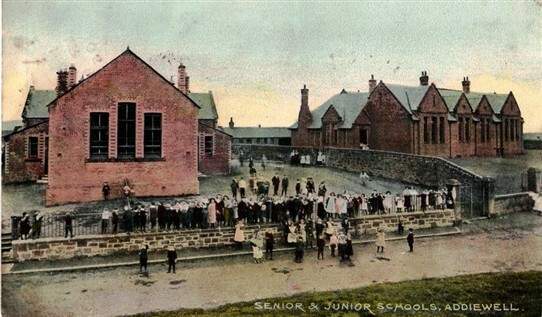 The junior and senior schools, c. 1910 - but which is which? Addiewell girls' class with three teachers, 1890s. John Kelly. All rights reserved. S1. 546. 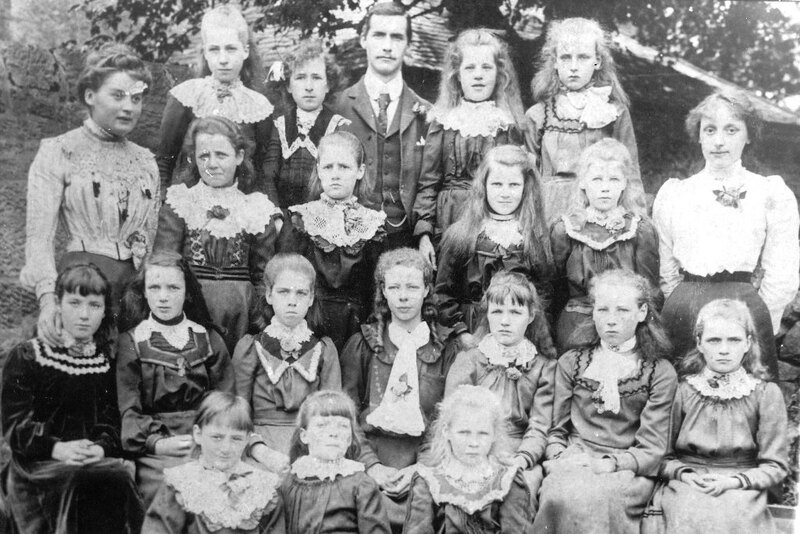 An Addiewell School class in the early 1900s. John Kelly. All rights reserved. S1. 235. The first school classes in Addiewell were held in the building that later became the Co-op. At this period, very few working class children got a secondary education – fewer than 5%. Most were educated at the “Public School", attending from age 5 to age 13. Then they left school, and went straight into a job. In Addiewell, the boys almost certainly went into the pits or the oil works. The girls probably left Addiewell and spent a few years in domestic service, before getting married. In 1872, the government made elementary education compulsory from the age of 5 to 13. Each parish was required to elect a School Board, and to raise money on the rates (and through a state grant) to build and run schools, open to everyone. Attendance was compulsory. For the first few years, there were small fees to be paid for every child attending. In a poor area like Addiewell, it was a struggle for many parents to afford the fees. In 1874, some Addiewell men formed themselves into an Educational Association, which set about raising money for an education fund. They recruited members and each member was required to pay 2d per week. If their child required schooling, and they were unable to afford it, the Association would pay the fees for them. By 1881, they were supporting over 1,000 children through their schooling – a notable example of self-help. The surplus money was devoted to running evening classes, and reading rooms at Addiewell and West Calder. In 1883, schools fees were abolished, and state education became free to all. The Education Committee continued to assist poor parents with buying books, clothing, boots, etc for their children while at school. In Addiewell, a new public (non-denominational) school was built on the raised site on the West Calder road, opposite the tollhouse, and opened in January 1882. It was a junior school - for younger children. A few years later, in 1897, a senior school was built alongside it, for older children. Detailed reports of the opening of these two schools were published in the local newspapers and can be downloaded as PDFs at the foot of this page. The May Procession gathers in front of the Catholic School. In the background the Chapel House, but as yet no Chapel. This dates the photo to the early 1920s..
John Kelly. All rights reserved. S1. 194. 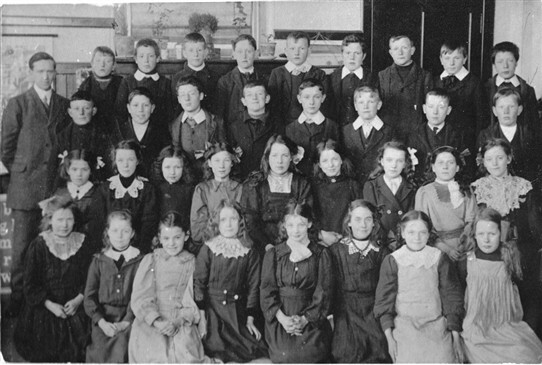 At the start of the 1916-17 school year, a Roman Catholic school opened alongside the public schools. 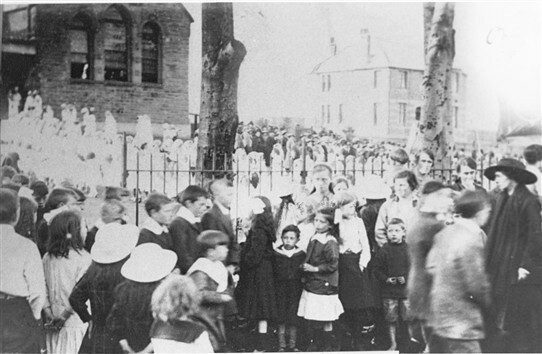 Presumably because of the war, the school opened without fanfare, and no report of a formal opening ceremony could be found in the local newspapers. At the time of the opening, there were 275 children on the school roll. The scheme to build the school was pushed forward by the parish priest, Father Kenny. He lived in Faraday Place with a family called Aitken, until the Presbytery was built for him next to the church (1922). In 1978, the Catholic Primary School in Addiewell and the non-denominational primary school were installed on a joint site under one roof. The children were taught in separate classrooms, but played and ate together. The joint campus continues to this day. Detailed report in the Courier of the opening ceremony in January 1882. Detailed report in the Courier of the opening ceremony of the Senior School in 1897. This page was added by Sybil Cavanagh on 21/04/2012. My aunt attended the school in Addiewell (starting in 1927 when she was 5 yrs old) having to walk the distance from Stoneyburn each day. And the whole family walked to Addiewell on Sundays to attend Mass at St Thomas' church. I had occasion to visit the area a few years ago, as part of my own family history trail, and was delighted to be shown around St Thomas' by Dr John Watts. St Thomas is the church where my mother and her siblings were baptised. How sad that the school next door lay in ruins. Addiewell's John Hanlon excelled both at football and running. Meadowhead House and its owner and architect, J.G. Fairley.